Macworld: News: MWSF: AJA releases KONA 3 video capture card: "AJA Video announced KONA 3, its new top-of-the-line video capture card. The company states the new card offers 40 percent more power than its predecessor the KONA 2. The KONA 3 is an uncompressed capture card for SD, HD and Dual Link 4:4:4:4 HD for PCI Express (PCIe) Apple G5 Power Macs and Apple Final Cut Pro. KONA 3 makes its worldwide debut this week at Macworld Expo at the AJA booth (booth #1449). The new card will ship worldwide on Jan. 30, 2006. KONA 3�s all new extensible architecture features a 4-Lane PCI-Express bus interface with integrated AJA QuickTime drivers that work with the new Apple Power Mac G5s and Final Cut Pro designed for power and workflow efficiency. Supporting any uncompressed SD or HD format, including Dual Link, KONA 3 captures and plays back uncompressed 10-bit and 8-bit digital video and 24-bit 48kHz digital audio. KONA 3 also includes a variety of 10-bit broadcast-quality features, such as hardware-based up-and-down-conversion to and from HD-and adds a live hardware keyer for compositing bugs, live clips, and other elements over video." Digitalizacion cuadro por cuadro de peliculas antiguas y modernas de 8, super 8 mm, 16 mm, fotografias antiguas y modernas, restauracion de film y peliculas para universidades y bibliotecas, telecine profesional para comerciales"
redrockmicro - "Film Look": "The Elusive Film Look for Digital Filmmakers"
"La imagen digital es mas brillante, mas aguda, los colores son mas claros y la imagen mas estable," sostiene Patrick von Sychowski, analista de Screen Digest, una firma britanica de investigacion de medios. Use 35mm film lenses on your digital video camcorder to achieve better images in HDV or MiniDV format. Depth of field, focus and angle of view are virtually the same as with a 35mm motion picture camera. 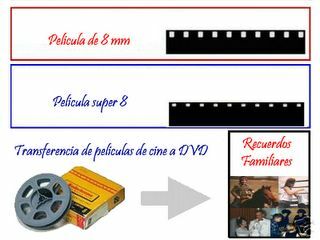 "Film Look": "The Elusive Film Look for Digital Filmmakers"
Posted by Unknown at 8:00 p. m.
Posted by Unknown at 3:08 p. m.
24 de enero Walt Disney, cuyas ultimas peliculas de dibujos animados han sido un fracaso en taquilla, acepto pagar 7,400 millones de dolares en acciones para comprar Pixar, el estudio cinematografico de animacion por computacion del empresario Steve Jobs. Jobs, a raiz de la transaccion, se unira al consejo de administracion de Disney. Disney, la segunda compana de entretenimiento mas grande de Estados Unidos, pagara 59.78 dolares por cada accion de Pixar, dijeron hoy las companas en un comunicado de prensa. Esto representa una prima de 3.8% respecto del precio de 57.57 dolares al que cerro la accion de Pixar el martes. La compra de Pixar transformara la filial de animacion de Disney, cuyas peliculas recientes de dibujos animados hechas a mano, entre ellas Treasure Planet, no atrajeron al publico como lo han hecho las cintas animadas por computadora. " Reports: Disney close to Pixar deal | CNET News.com: "Walt Disney Co.'s board of directors has given its approval to make an offer to buy Pixar Animation Studios, the independent studio responsible for hits such as 'Toy Story' and 'The Incredibles,' according to published reports. " De acuerdo a un sondeo de la revista de internet Brandchannel, la cervecera mexicana ocupa el lugar numero uno, seguida de Bacardi Movistar, Havaianas y, en quinto sitio, Cemex." Posted by Unknown at 9:49 p. m.
CBS O&O�s WBZ, in Boston, and WBBM, in Chicago, will be the first stations to make the switch to Sonys HD XDCAM gear. CBS News has begun a migration to high-definition news acquisition. In March, the network�s owned-and-operated stations at WBZ-TV, in Boston, and WBBM-TV, in Chicago, will be the first to use Sonys XDCAM HD Professional Disc system for its local programming. The other 15 CBS stations will begin converting to XDCAM HD throughout 2006 and 2007. HD news is a hot topic on the minds of many in the industry, and it�s critical to have the right technology in place when it�s time to make the switch, said Bob Ross, senior vice president of East Coast Operations at CBS Television. " Posted by Unknown at 9:43 p. m.
Google tops Apple in 2005 brand poll | CNET News.com: "Internet search engine Google has retaken first place in the 2005 global poll of the world's most influential brands, while the eBay-owned Web phone service Skype makes its debut at No. 3. The annual survey compiled by online branding magazine brandchannel.com often throws up controversial results, such as in 2004, when Arabic TV station Al Jazeera was voted the world's fifth most influential brand (down to 25th place this year). But this year, the 2,528 branding professionals and students who voted came up with more conventional and--perhaps unsurprisingly for an online poll--tech-heavy answers when asked 'Which brand had the most impact on our lives in 2005?' "
Posted by Unknown at 10:08 p. m.
The Attention Economy: The Natural Economy of the Net: "We are living a temporary attention economy in miniature right at this moment." Posted by Unknown at 10:41 a. m.
Diseñados para un mundo predigital, las leyes y modelos de negocio que rigen las relaciones entre autores, editores y consumidores de cultura ya no sirven. En la Red regalar y permitir la copia es la mejor manera de triunfar. Ponencia presentada en el IGC 2004, Barcelona." Posted by Unknown at 10:32 a. m.
Carl Zeiss Camera/Cine Lenses: "For the first time Carl Zeiss offers lenses which directly fit a world leading 35 mm SLR system, the one that, for half a century, has been the premier choice of demanding photographers, professionals and amateurs alike, all over the world: Nikon F. Analogue and digital! In addition maybe even more important ZF is leading Carl Zeiss to a major change in its photo lens business plan: For the first time, Carl Zeiss will set up its own distribution organisation instead of delegating the selling of Carl Zeiss lenses to camera manufacturers. We are at the beginning of a very interesting future! " Konica Minolta has long been a leading company in photo imaging business covering wide range of imaging from input to output. In addition, we have provided inspiring products and services by fusing our unique technologies. " Sony Business Solutions & Systems - Featured: "The concept of the CineAlta system is to provide digitally, to the degree possible, many of the wonderful imaging attributes of 35mm motion picture film while adding expanded creative flexibilities that are indigenous to digital acquisition and post production. The '24' refers to the image capture rate of 24 frames per second, which fully emulates the globally popular 24-frame picture capture rate of motion picture film. The 'P' stands for 'Progressive' scanning, which also replicates the way that film is exposed, with the entire frame representing a single instant in time. 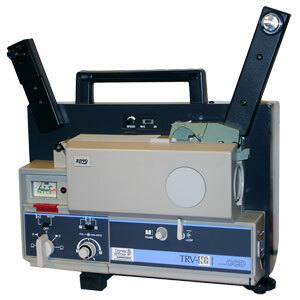 In addition to bringing the 'look' of this new digital medium closer to that of film, the 24P system expedites the post processes of transferring to or from motion picture film. 24P empowers directors and cinematographers on the camera set - offering unprecedented and exciting real-time creative capabilities while shooting - to realize the innovative imaging aspirations of digital production." PARK RIDGE, N.J., Jan. 18, 2006 - The next generation of Sony's XDCAM Professional Disc system - a line of high-definition optical camcorders and decks unveiled today - offers cinematographers, broadcasters and video professionals a complete toolkit of flexible, digital production options. With the introduction of the XDCAM HD system, Sony is extending its CineAlta family of cinematic, broadcast and professional production systems by giving these new products the CineAlta brand. Since 2004, the standard definition version of the XDCAM system has been adopted by news organizations, videographers and for television production, especially in the reality TV genre. Corporations, educational and government facilities, houses of worship and major sports teams have also implemented Sony's optical technology. PARK RIDGE, N.J., Jan. 18, 2006 - The next generation of Sony's XDCAM� Professional Disc� system - a line of high-definition optical camcorders and decks unveiled today - offers cinematographers, broadcasters and video professionals a complete toolkit of flexible, digital production options. " Posted by Unknown at 1:04 p. m.
Posted by Unknown at 12:39 p. m.
New logo for Kodak: Digital Photography Review: "Kodak will be saying goodbye to their famous yellow-box logo in favour of a simpiler more contemporary design." Posted by Unknown at 10:39 a. m.
According to published reports of Bill Gates' annual ritual of addressing the CES, the world's richest known human is apparently counting on Microsoft's recent Xbox 360 game console release to do what sitcoms and the Super Bowl have not done yet--make owning an HD monitor a must for young consumers. Microsoft reportedly released some internal survey data in Las Vegas that linked likely purchases of HD sets directly to the new Xbox. The company said about 90 percent of new Xbox 360 owners 'either own an HDTV or plan to buy one in the next six months.' (That always seems to be the catch in these surveys, i.e., the 'plan-to' crowd, so time will tell....) Gates also said about 90 percent of those same Xbox owners say the game console itself is the main factor in their decision to upgrade to HD. " Up and down Chicago's West 26th Street, where ranchera music thumps and street vendors hawk pork rinds called chicharrones from gallon pickle jars, residents take nearly as much pride in their imported Coca-Cola as they do in flying red, white and green national flags. The neighborhood is one of the nation's largest consumers of Mexican Coke, a sweeter - some say - version of the American soft drink shipped north in heavy glass bottles. The U.S. Coca-Cola Co., which does not make money from Mexican Coke, has taken notice and is trying to win over soda pop drinkers in this economically bustling area known to locals as la Villita." Posted by Unknown at 11:05 a. m.
10 de enero La semana pasada, el anaquel medio de la sección de refrescos de Las Tarascas, un supermercado latino en Lawrenceville, Georgia, estaba vacio. Pero el gerente de la tienda, Erik Carvallo, no podia llamar a la embotelladora local de Coca-Cola para pedir mas productos. Carvallo se habia quedado sin Coca-Cola en botellas de vidrio, estampadas con la leyenda Hecho en Mexico. Estas llegan a este suburbio de Atlanta a traves de una cadena de suministro informal, que desconoce el tradicional "
Posted by Unknown at 11:01 a. m.
Posted by Unknown at 11:50 a. m.
Posted by Unknown at 11:45 a. m.
MipTV featuring Milia - The World's Audiovisual and Digital Content Market: "QUE S EL MIPTV? Un marco ideal para negociar derechos de programacio, coproducciones y alianzas "
En el analisis sobre los acontecimientos mas destacados de 2005 que realizamos en la newsletter Private Advisor el mes pasado, anotamos la aparicion de un fenomeno relativamente nuevo que puede modificar sustancialmente el perfil de la industria de la television por cable en un futuro cercano: la posibilidad de acceder a programas de television a traves de Internet." Natpe 2006 will be held on January 24-26 at the Mandalay Bay Hotel and Convention Center in Las Vegas, Nevada. This meeting and the L.A. Screenings are considered the two most important trade gatherings referred to Latin American television. Once again, the powwow is divided between the Convention Center at the Mandalay Bay and a tower known as THE Hotel, sought by those that choose dealing from a hotel suite instead of a booth. The distribution is alike what was seen in 2005, with a slight strengthening of the floor part of the show. Hollywood majors Sony-MGM, NBC Universal, Fox and Warner are at booths, while Buena Vista and CBS Paramount have suites. The balance changes a bit when you consider the international sales displays: Fox has a suite, turning it into 50% and 50%, And, the Latin American distributors like better the suites, a choice shared by the main format players, domestic or international. The European and U.S.-based independent distributors are mostly at booths, while the smaller Latin American favor suites." About Google Video: "You've found the world's first open online video marketplace, where you can search for, watch and even buy an ever-growing collection of TV shows, movies, music videos, documentaries, personal productions and more. " Macworld: Intel-based Macs built for speed | Tech News on ZDNet: "The new iMacs will go on sale today, Jobs said. He also said Apple will transition its entire product line to Intel chips during this calendar year. Fresh from demonstrating the Intel-based iMacs, Jobs started talking about the status of software for Intel Macs. He noted that his demos of the new iLife were all done on Intel-based Macs. Microsoft Mac Business Unit General Manager Roz Ho came onstage and announced that Microsoft is moving ahead with efforts to create an Intel-based version of Office for Mac. " If you get a really good cinematographer to work with, what the HVR-Z1U camera is able to do with the three CCDs and the lens it comes with is unbelievable. You still need to take care of your lighting� control your highlights, contain your environment. In our tool kit we had three ND filters and a sky filter. But with 1920 x 1080, you essentially have amazing real estate. We did something that we hadn�t seen done with HDV before� we shot preserving for 2.35:1 Cinemascope. We felt that it would showcase the beauty of the Jersey Shore, which is a principal character in our story. Because Cinemascope is much wider than 16:9, we did the old trick of putting two pieces of tape on the viewfinder. In post we clipped the top and bottom." Whenever one hears the name Nizo, one thinks of quality and design. 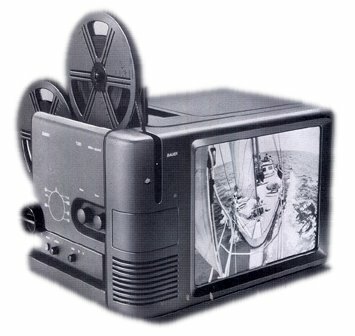 Nizo�the noble German trademark, as far as movie cameras are concerned. Nizo owes this honor primarily to the fortunate twist of fate of being sold in 1962 to Braun AG. It was at that point that technological quality was merged with excellent design. In 1934, Nizo´s Munich plant was making 10 movie cameras a day. In 1973, at the apex of the Super-8 boom, it was making 300, by the end of 1980, 205. In a year it could never make more than 69,308 devices, as many as the Japanese manufacturer Chinon was producing in a month. But quantity does not always mean quality. Today Nizo is a legend, and Chinon has long been forgotten." Posted by Unknown at 10:01 p. m.
A Guide to Nikonians - Worldwide Home for Nikon Photographers: "A friendly user community and the worldwide home for Nikon photographers, no matter your level of expertise, where you are from or when you log in"
Posted by Unknown at 4:40 p. m.
The BBC is allowing Internet users to download and edit news clips featuring some of the biggest events of the last 50 years. Posted by Unknown at 12:02 p. m.
Facts and figures Estadisticas interesantes acerca de Mexico"
OH Boy It was a pleasure receiving the 1st issue of small format magazine. Like all your excellent books you exceeded all expectations. The magazine is superb and I would say that the decision of making it in English was correct because it allows many people around the world to access all your info. Posted by Unknown at 8:11 p. m.
Posted by Unknown at 7:20 p. m.
super 8 and small film news blog onsuper8.org: "With the New Year fast approaching, the team here at onsuper8.org thought we'd have a quick look back at some of the happenings from 2005 (cue dreamy flashback music)..."
Posted by Unknown at 6:26 p. m.
Posted by Unknown at 6:22 p. m.